Dec. 3, 2017 1:03 p.m. The Ballenas Whalers junior varsity finished second best in the B.C. AA Junior Varsity Subway Bowl Championship Saturday at B.C. Place Stadium in Vancouver. Their journey didn’t end the way that they wanted, but the players can still be proud of themselves for reaching as far as they could this season, head coach Dan Smith said. 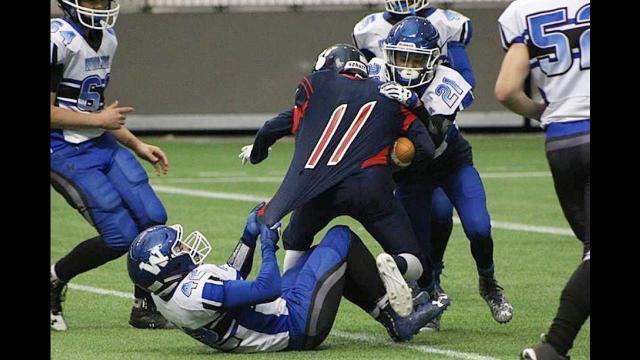 The Whalers were stymied by the suffocating defense of the Vernon Panthers, who went on to record a rousing 36-8 victory to snag their first provincial school football championship. The Panthers finished unbeaten this season. Disaster struck for the Whalers on their first possession, when quarterback Ben Chomolok fumbled the ball on their initial snap and the Panthers recovered the ball. It led to the Panthers, on second down, scoring a touchdown pass by Caden Danbrook and a conversion by Liam Reid. The Whalers, still reeling from the early Panthers’ touchdown, appeared to have shaken it off as they completed their first rush play. But on second down, the Whalers fumbled the ball again. And that cost them dearly as well, as the Panthers notched another touchdown right away, again courtesy of Danbrook, with Reid’s convert making it 14-0 for Vernon. The Whalers were not able to recover after that. They were able to execute some of their offense but could not find the consistency that marked their regular season and first two playoff rounds. The errors were just too prevalent, said Smith, and the Panthers made them pay with a lethal offence. “We made some good plays throughout the day, but they (the Panthers) just had a lot of talent on the field and you just can’t make mistakes against them. And we did,” said Smith. Ballenas avoided the shutout late in the game, when Chomolok hit Nathan Robinson and appeared to have scored a touchdown. But the play was called back. Running back Steven Boley came through for the Whalers rushing for a six-yard touchdown. Chomolok then threw to tight end Bruce McCabe for a two-point conversion that made it 36-8. “When you’re having a day like we’re having where it’s tough — to get some points on the board late in the game, is a good feeling for sure,” said Smith. Smith said the players also learned a lot from the loss and it will help them when they prepare again for next year’s football season.